Do Chain Link Fence Posts Need to Be Secured by Concrete? Securing your fence posts with concrete makes your fence more stable and reliable. Anchoring your chain link fence posts with concrete is a sure way to make sure your fence stands strong for years to come. But do you always have to do this? When does this step NOT need to be taken? Basically, you can skip this step if you want, but it will mean that your fence will not be as strong. Knowing the type of soil your chain link fence posts will be lodged in will help you to determine how stable the ground is and decide whether or not you really need concrete. For example, clay soil expands and contracts with temperature fluctuations, so concrete anchors are necessary for extra stability. Are you installing a chain link fence with concrete anchors yourself? You’ll need a lot of tools and supplies, including pre-mixed concrete, gravel, a trowel, fence posts, chain link mesh, gates, post-hole digger, power auger, fasteners, tension bars and wires, a hacksaw or pipe cutter, shovel, line level, mason’s line, plumb bob, rubber mallet, socket wrenches, pull bar, fence puller, and pliers.. If this seems a bit daunting, you may want to hire Hercules Fence to install the fence for you. Chain link fences are one of the easier and faster fences to install. If you decide to forego concrete anchors, you’ll have to make sure that you install the chain link fence posts deep enough to keep the fence stable. You’ll need to use a post-hole digger to dig holes deep enough to bury the posts at least two feet, or one-third of the fence height, into the ground. The hole should be bigger than the diameter of the fence posts so that you can then fill in the hole with backfill after the posts are secured. Avoid pounding the fence posts into the ground, since this can bend the tops. While you may save money on the supplies you need for the concrete, you may find that the long-term benefits of concrete anchors outweigh the short-term savings. 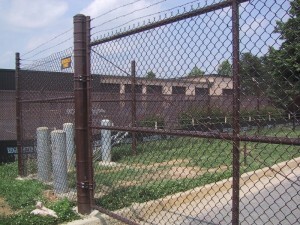 If you choose Hercules Fence of Richmond, VA today, you’ll learn why we’re the best in the business. The knowledgeable people of Hercules Fence have developed a reputation since 1955 for professional service and quality installation. With over 50 years in the fence business, we are well aware that our reputation must be earned a new every day. Give us a call at 804-752-7992 or visit us online. To see examples of our work and keep in touch, don’t forget to follow us on Facebook, Twitter, Google+, LinkedIn, Flickr, and Pinterest. This entry was posted on Monday, October 24th, 2016 at 3:54 pm. Both comments and pings are currently closed.